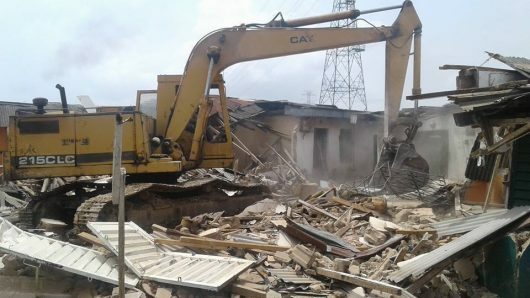 The land dispute rocking the authorities of the Federal Capital Territory Administration (FCTA) and DAAR Communication Plc took a different dimension as the officials of Department of Development Control (DDC) yesterday pulled down the gate house and perimeter fence of the private media firm over alleged land encroachment. Our correspondent reports that officials from the DDC of the Abuja Metropolitan Management Council (AMMC) led by the Director, Murktar Galadima, accompanied by a joint team of security personnel removed a portion of the fence around the premises of DARR Communication, operators of Africa Independent Television (AIT), in the Asokoro District of Abuja. PeoplesDaily gathered that 18 hectares of land was originally allocated to DAR Communications, but over the years the media giant encroached to five adjoining plots, belonging to others. Recall that during the November 2018 meeting, the duo had mutually agreed to reach an out-of-court settlement that would bring about permanent solution and forge ahead with the development of the FCT and the nation. Though, there was little or no resistance from the DAAR group but the company’s GMD, Mr Tony Akinotun who said they were taken aback by the exercise, assured that the position of the Daar group will be made known soon. Speaking after the removal exercise, the Coordinator,Abuja Metropolitan Management Council (AMMC), Umar Shuaibu said the demolition was due to the illegal encroachment into plots of lands belonging to many Nigerians and the refusal by the Management of DAAR Communications to abide by the mutual agreement reached between it and the FCT Administration. He recalled that in November last year, the Management of DAAR Communications led by High Chief Raymond Dokpesi paid a courtesy visit to the FCT Minister and they were received on his behalf by Chief of Staff to the FCT Minister, Bashir Mai-Borno who led the FCTA team made up of relevant directors and others in the discussions. “ It is also a culmination of series of meetings between the Management of DAAR Communications owners of AIT and the Federal Capital Territory administration to end many years of misunderstanding. “The purpose of the discussions was to resolve the protracted dispute regarding the actual size of land legally allocated to DAAR Communications as against the area covered by their perimeter fence. The whole idea was for both parties to mutually agree to reach a settlement that would bring about permanent solution and forge ahead for the development of the FCT and the nation at large. “After very fruitful deliberations on the areas of contention, each side expressed satisfaction over the new reconciliatory approach and the sincerity in reaching a logical and peaceful conclusion. “Thereafter, both parties agreed to visit the site for an on-the-spot investigation of the area were surveyors from both parties were able to identify the problematic areas on a satellite image map, leading to a common agreement on the necessity to remove the portions of the fence that has encroached into adjoining plots of land belonging to other Nigerians”, he stated..
“Unfortunately, while everybody is happy and pleased that the issues have been resolved and in line with the commitment of both parties, DAAR Communications has been evasive in doing its part by voluntarily removing the illegal fence and other structures causing obstruction to their neighbourqas.